First there was ‘The Calvinist’. If you’ve not seen that video or my parody of it you can find them both here. 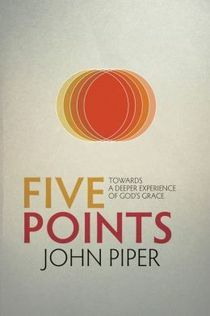 The latest video is a book teaser for Piper’s newest book ‘Five Points’. You can find the video at the Gospel Coalition website here. I encourage you to watch the video and reflect on it yourself before reading my ramblings. Piper is blessed with an incredibly moving voice. It’s one of those voices that you might hear in a film trailer in the sense that it is dramatic and leaves you wanting more. Add to that the professional video and the lovely music and you have a recipe for a wonderful video. In that sense I enjoyed this video. I’m left wondering the very same thing I was last time. Last time I did not express it directly but wrote a parody which suggests the same point I am making here. Why is it there is so little distinctive Calvinist theology being expressed in the video? Since I’ve already compared it to a movie trailer it feels like I’m watching a trailer for an action movie when actually the movie is a romance. This is false advertising. In fact, it’s hard to find anything distinctively Calvinist in anything Piper says in this short video. He gives a short testimony which uses the exact same language I hear Arminians and Molinists use of their experience with God. So my first concern is that the Calvinism being promoted is also being hidden in these promotions. Now hold on there just a moment! Surely that has to be a really poorly expressed testimony? I mean, what Christian would really want to suggest that a secondary Christian doctrine (that is to say a doctrine of the church which is broadly not considered a test of one’s orthodoxy or being central to one’s salvation) was so precious to them that IT got them through their trails and tribulations. But that appears to be what Piper is saying. Now I might be wrong. I hope I am wrong. But that is how it reads to me. I am not convinced that any Christian leader ought to be holding up any secondary Christian doctrine as a pillar to cling to in one’s suffering. I would think that what such teachers should be doing is pointing them to the person of Christ. From 2:04-2:07 Piper says “These doctrines have been our life…” Really? I struggle to think of any secondary Christian doctrine that is so precious to me that I could call it “my life”. So that worries me. From 1:35 Piper expresses his concern over the stereotype of Calvinists. He thinks they are wrongly considered to be cold, “logic driven”, more systematic than Biblical, prayer less, and don’t engage in mission or evangelism. Piper says that both historically and in his experience this is not the case. Well I think that you could make a historical case against some of those stereotypes. Clearly Calvinists have strong traditions of prayer and evangelism. I don’t even know how you could show historically how Calvinists have or have not been, on the whole, ‘cold’ or not. But surely the stereotype of being systematic is much deserved? Look at how many systematic theologies have been written since the Reformation and how many have been written by Calvinists. I have seven systematic theologies on my bookshelf and all seven are by Calvinists. I can only think of a small handful of systematic theologies that are not Calvinist. So I think Piper will struggle to get rid of that stereotype anytime soon. I’m also not convinced about the point of logic either. I tend to think that is the stereotype of the Molinists rather than the Calvinists. In fact, given how frequently Calvinists play the mystery card, or that they sometimes appear to rejoice in making logically contradictory propositions as if that proves Calvinism is more pious because it’s harder to make sense of, I wonder how that could be a stereotype at all. This last point I want you to listen to most carefully. Piper talks about his struggle with cancer and how this time of his life was precious. He points out how God can use suffering to do great things in our lives and this I do not doubt to be true. I think it’s wonderful to hear John’s testimony on this matter. Honestly I do. I just have to question whether that needs to be everyone’s experience of suffering and whether one needs Calvinist doctrines to feel God meeting with them in their suffering? I certainly don’t see the latter as necessary. I know many people who could give them same testimony about cancer and whose testimonies are just the same as John’s and yet they are not Calvinists. Could it be that it is not actually Calvinism that is the comfort in these times but perhaps Christ? And what of the Psalmist? What about the tears? What of those who despair in their suffering? What about the sense of injustice? What about the feeling that this is not God’s will? What of those who are genuinely Christian and who feel abandoned and feel that time of their life was the furthest they have ever been from God? What about those who cannot yet tell their story of suffering with the benefit of hindsight? Does Calvinism offer them hope that Molinism or Arminianism does not? Personally, I doubt it. In fact, for reasons I have given in previous articles on Calvinism I have written, I think it creates many more problems. For myself, as someone who has suffered with regular medical problems for just over seven years now, I would say that my comfort does not come from a doctrinal system. I have read both John Calvin and Jacob Arminius during my suffering and, while I enjoy reading them both, I find little comfort reading them. I have found that there is only one true ultimate comfort for suffering and that is Jesus Christ and knowing him. I will look to him rather than a doctrinal system for comfort. PS. Either the moderators over at the Gospel Coalition have gone on holiday or posts under John Piper videos which express polite concern are not welcome. You may only post if you have something glowing to say it appears! This entry was posted in Arminian Theology, Calvinism, Theodicy and tagged John Piper, Theodicy. Bookmark the permalink. “The doctrines of God’s grace are my life” – sadly Jesus doesn’t get a single mention in the whole video. This is nothing less than idolatry.